As well as doing better than expected in the polls, the Liberal Democrats website is best out of ten political party sites in the UK, with the Conservatives in second place, and Labour’s site at number seven. This is the verdict of a Webcredible study of UK party websites, which gives the Lib Dems’ site 80%, while the Conservatives scored 67% and Labour on 48%. We know already that the party leaders’ websites are pretty poor, but it also seems that most political parties have a lot to learn about user experience, with an average score of just 50%, and only two sites scoring over 60%. One of the most important things that visitors to political websites are looking for are contact details; they may want to contact their local MP or candidate, or else join the party or volunteer to help. Both Labour (with one point) and the Conservative party (two points) scored poorly for promoting contact details. Both bury the contact link among a lot of small text at the foot of the homepage. Labour doesn’t provide any email address, just a contact form which requires the name and addresses of users. The Tories do the same, but at least the site allows users to search for their local MP or candidate, providing contact numbers and email addresses for them. The Liberal Democrats get full marks here, thanks to a prominent contact link at the top of the homepage and providing email and phone details for local party offices and MPs. As on any e-commerce website a useful site search option can help users to find information if they can’t access it by browsing, or else prefer to search by keyword. No points here for Labour, as it doesn’t have a site search option at all, at least not one that I can find. Both Conservative and Lib Dem sites do have the option, prominently displayed at the top right of the page. The average score for site search and presentation of results was 1.5 (out of five) and 1.6 respectively, so this is an area where there is plenty of room for improvement. If visitors are arriving at these party sites with the intention of taking a particular course of action, such as joining, or are looking for policy information, it should be easy to find out where to go from the homepage. This is an area where most websites are performing reasonably well. Of the three main parties, Labour and Conservatives both scored three out of five, with the Lib Dems gaining full marks. Finding out about the party’s policies. Finding out why to vote for the party. Getting information on party figures. While the Labour and Conservative homepages mark it hard to find information about party figures, the Lib Dem homepage provides an excellent example, providing all of this key information clearly, and above the fold. It also uses photos and icons to make this key information more clearly visible. In my last post, I argued that the growth of Facebook is such that marketers can no longer ignore it as a platform. However, I also mentioned that it is much less mature than search marketing, and as such best practice techniques aren’t as well developed. So in this post I’m sharing my thoughts on how best to use this fast emerging channel most effectively, based on how we see agencies and advertisers using our platform to manage Facebook campaigns. Early last year I wrote a post about online influence measurement service Klout, I ran a few simple tests and came to a conclusion: Klout doesn’t work. Based on several recent articles supporting the service, I thought it was worth taking another look at Klout and restating a few points about the value of online influence and measurement. Wikipedia is losing editors. Is free user generated content dying? Wikipedia may be the fifth-most-popular website in the world, but most of those viewers come to look without adding or changing any of the content on the site. 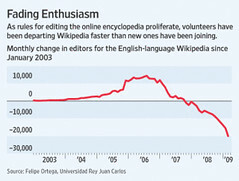 And if viewers stop contributing content, Wikipedia will cease to survive. According to the Wall Street Journal, that’s not so far fetched. Wikipedia is currently hemorrhaging article editors. If Wikipedia can’t get people to contribute to its voluble entries, is it possible for free user generated content to survive?